Yesterday, I started my Pilates journey with The Pilates Pod in Hitchin. Located on Bancroft in Hitchin, The Pilates Pod is an award-winning studio and the only Classical Pilates Apparatus studio in Hertfordshire. Last year, I did a taster session here and was really impressed with the standard of teaching. True, the Classical apparatus looks a *little* scary at first but it’s not so bad once you start using it. And I have a feeling I’m going to be getting very familiar with it over the next few weeks! I did practice Pilates in my early twenties and I remember it doing amazing things for my core. Can it do the same for me again in my thirties, and post childbirth? The classes I did back then were basic matwork and we didn’t use any special equipment. I have a sneaky suspicion that attending classes at The Pilates Pod is going to completely change all my perceptions of Pilates and what can be achieved with a dedicated, Classical practice. I love the vibe at The Pilates Pod. It’s super friendly and supportive, but there’s also a feeling of, “We’re going to work you hard and get results.” And that’s exactly what you want. Classes are kept small, and the teachers are highly experienced. There’s no judgment here. It’s not about how you look. It’s about how you feel, how you move, and how you live. My 1:1 session was with Ellen. She’s lovely and really put me at ease. We started with a consultation to find out more about me and my body. We discussed my hamstrings that have been tight FOREVER, my painful lower back that flares up fairly regularly, my mild scoliosis, and my flat feet. Oh dear, what a list! Ellen then took me through 55 minutes of exercises to start work on building my strength and improving my movement. Check out some of the exercises below. And please excuse my double chin, it’s hard to look good while exercising! I have a new-found respect for fitness models, ha! If Pilates is going to work for you, you need to understand its principles. The thing with Pilates is, if you watch someone doing it, it looks easy. But there’s an awful lot going on in every single movement in Pilates – if you’re doing it right, that is. Pilates is about dynamic movement, strength and control. You’ll learn how to get your mind and body to work together. Founder Joseph Pilates was a boxer and gymnast, and developed a practice called “Contrology” – which later became known as The Pilates Method. Classical Pilates is Pilates in its truest and most authentic form – just as Joseph Pilates intended it. I thoroughly enjoyed my 1:1 with Ellen. She’s a fabulous teacher – she understood my body straight away, gave clear instructions and was very supportive. I left the studio feeling great and like I’d had a whole body workout (which I had!). My muscles felt like they’d worked really hard but there was no pain because Ellen had helped me to focus on doing the exercises properly. 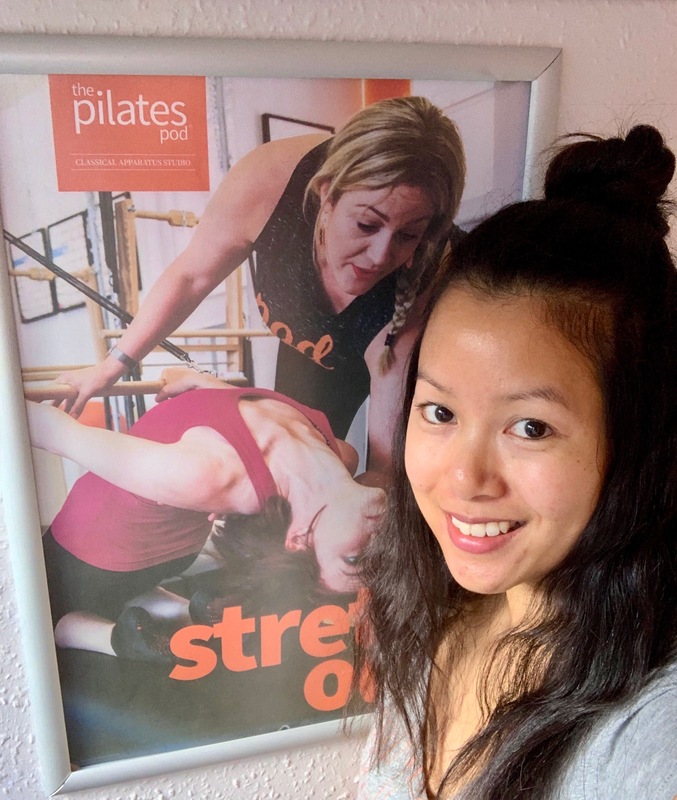 I’m so excited to start my Pilates journey with the amazing Pod Squad at this wonderful studio in Hitchin…and I’m looking forward to sharing it with you guys! I know a lot of you suffer from similar issues to me. Bad backs, in particular, are so common among us mums. So let’s see if Classical Pilates really can help us to move, and live, better. We’re definitely off to a positive start. Please check out The Pilates Pod website for more information about the studio and the classes they offer. You can view their extensive class timetable here. Disclaimer: I received this 1:1 session free of charge in exchange for a review. All words and opinions are my own.